This Sussex holiday cottage forms a little oasis in the heart of Brighton with a 4-star rating from the English Tourist Council. Two charming 2-bedroom Regency terraced cottages offer extremely convenient accommodation, either for a memorable holiday-let or comfortable business trip. 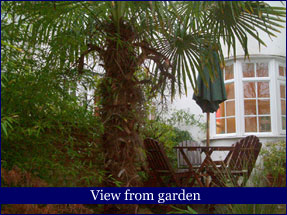 Situated in the centre of Brighton in a conservation area. Close to the shopping centre and minutes walk from Brighton Railway station. The Seafront and Conference centre are 10 minutes walk away. Tasteful decor & furnishings. 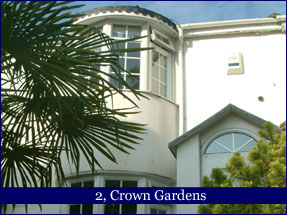 Peaceful front and rear terraces with tropical plants. Both cottages sleep 1 to 6 people. Each residence has 2 double bedrooms both with a double bed and adequate clothes hanging and drawer space - bathroom with shower over bath, basin and wc - kitchen with gas/electric cooker, dishwasher, washing machine, microwave, fridge, freezer, coffee maker - sitting room with sofabed, coffee table, colour TV/CD player/DVD, dining table and four chairs. Telephone installed and set for incoming calls only. Smoking is not permitted inside. Facilities include linen, towels and electricity for 4 people. Use of the sofa bed will cost an extra £50 per week. Pets are welcome, but must be on a flea treatment recommended by a vet. Proof of this must be sent with the balance payment. Guests must vacate the property by 10am on their day of departure. There is no off street parking available, but if requested we can provide information on parking alternatives. There will be a £100 refundable damage/cleaning deposit. This will be returned in full as soon as possible after the property has been inspected, providing that the property is left in a clean and tidy state and that there are no breakages. Alternatively if paying by credit or debit card, card details can be held in lieu of the paying the amount up front.